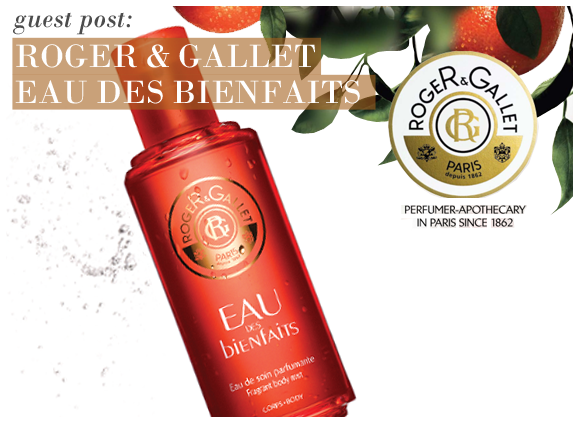 Roger & Gallet are renowned fragrance and skincare experts, and with their latest release they fuse the two into one dispensable product: the Eau Des Bienfaits. This fragrant body mist is also a stimulating skin treatment, and is packed full of essential oils and natural active ingredients which work to hydrate and soften the skin. The supremely hydrating and soothing power of aloe vera is paired with cell quenching kiwi extract, energising ginseng and smoothing lemon fruit acids to pamper and renew the body. The spray has an ultra-light texture that doesn’t feel oily in the slightest – just refreshing, cooling and hydrating. The scent itself is brand new. Inspired by the delights found in an Italian garden, the Eau des Bienfaits fragrance is centred around the reviving essence of blood orange. This is blended with bright notes of mandarin, bergamot and lemon, powdery notes of violet leaves and orange blossom in the heart, and a sensual dry down of cedar and patchouli. Use on tired legs after a long day, in the summer as a cooling mist, or after the shower to recreate that spa-like feeling of total relaxation. This essential oil-packed, versatile fragrance is a bathroom essential. This entry was posted on Wednesday, February 22nd, 2012 at 8:00 am and is filed under Fragrance, Skincare. You can follow any responses to this entry through the RSS 2.0 feed. You can skip to the end and leave a response. Pinging is currently not allowed. This sounds lovely! Is it comparable to one of the Eaux by Clarins? In terms of scent I would say that it is reminiscent of the fruitiness of Eau des Jardins, but with a touch of Eau Dynamisante spa herbal freshness. It’s really very lovely! As for the aromatheraputic and toning effects of the treatment fragrance, it is definitely comparable to all of the Eaux. It makes you feel very refreshed. Thank you for the reply! It sounds even more interesting now!